Hello, everyone. Some of you likely have noticed that I haven't updated this blog since July 8. Rest assured all is OK with me, my husband, my family--even my cat. 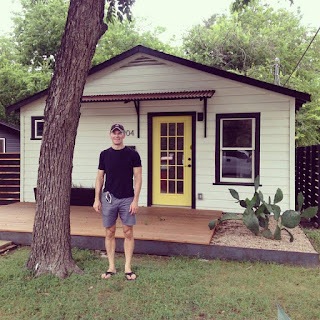 As for why it's been a whole week since I last published a post here, the answer is pretty straightforward: I've spent that time driving across the country (from Wisconsin to Texas) and moving into the cute little home my husband and I bought about a month ago. The house in question is showcased in the photo above. Actually, so is my rather handsome (if I do say so myself) husband. Want to see some more snapshots of my house, my husband, my cat, myself and some of the amazing things we've seen this year while living in various parts of the southern and southwestern US? Check out the photos I've shared on Instagram. Don't worry, I'll return to publishing two or three blog posts a week shortly. In fact, things should get back to normal on Monday or Tuesday--as soon as we gain access to the Internet at our new abode.